Bletchley Park hardly looks like a place where wartime secrets were hidden. But the code breakers at this late Victorian country house, about 50 miles northwest of London, led a double life as exciting as double agents in the movies. The house, built for a wealthy City of London financier in 1883, was about to be demolished when the British government, on the brink of World War II, acquired it for another purpose. Throughout the Second World War and on into the early years of the Cold War, Bletchley's ordinary, domestic appearance belied its real, clandestine activity - a purpose that remained cloaked in the Official Secrets Act for years. For here, behind closed doors and hidden deep in the center of a 60 acre estate, British boffins cracked the Enigma codes of Nazi Germany. Now, at the Bletchley Park Museum and National Codes Centre, that amazing secret story is being told. 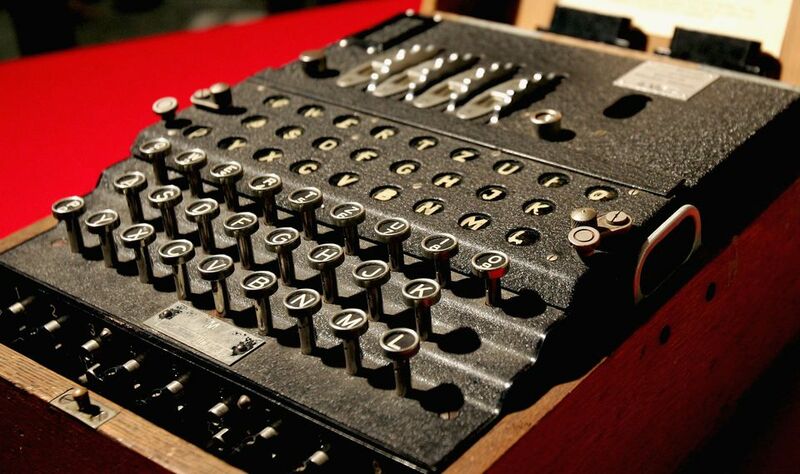 Enigma was an encoding machine developed by the Germans between the First and Second World Wars. It looked a bit like a typewriter but, via a series of mechanically and electrically driven rotors inside it, letters or combinations of letters could be changed into apparently randomly selected substitutes. The codes were vastly more complex than simply substituting one letter for another. In fact, there were, potentially hundreds of millions - perhaps even billions - of possible combinations. A key, changed daily, unlocked the code so that messages could be transmitted and understood. Unlocking the operation of the Enigma codes made a major contribution to victory for the Allies in World War II. In 2000, British film critics were sniffy over an American film, U-517, about a gung ho, American submarine crew on a mission to capture an Enigma machine that hastened the end of the war in the Atlantic. Everyone in Britain, of course, knew, that it was the Royal Navy that had captured the machine and it was the codebreakers at Bletchly Park who unlocked it - a story featured a year later in Enigma, a film with Kate Winslet based on the wartime thriller Enigma, by Robert Harris. In fact, both films were based on true stories. Enigma messages were being read as early as 1940 after some of the rotor wheels were captured on survivors of a German U-boat sunk off Scotland. And, in 1941, British Royal Navy Commandos captured several Enigma machines and their keys - from a fishing trawler off the coast of Norway and later from U-110. But in June 1944, a US Navy Task Group captured an Enigma machine and code books from another German U-boat, U-505, which was also vital to WWII codebreaking. And, to give credit where credit is due, Polish codebreakers were already working on Enigma codes in the 1930s, before the war broke out. They passed their knowledge onto the French who then shared it with the British. The truth is, there were several Enigma machines and the process of cracking their codes went on - mostly at Bletchley Park - throughout the war. What Can You See at Bletchley Park? Nine Enigma machines, including one on loan from the the US National Crytologic Museum; another, used in the Spanish Civil War on loan from the Spanish Army Museum in Toledo, Spain, and a rare Abwehr Enigma used by the German SS. Colossus, an early tape reading, code breaking computer and the world's first electronic computer. Colossus helped Allied commanders ensure that the Germans had fallen for the disinformation that concealed the D-Day landings. A reconstructed Bombe machine, another early computer, that made decoding large numbers of Enigma messages possible. A range of exhibits that tell the story of Bletchley Park, of spies, secrets and daring missions, as well as exhibits ranging from period cars and toys to cleverly disguised wartime wireless sets. The Secret Post Office, that served the 12,000 who lived and worked at Bletchley Park but remained secret until a documentary in 1998. The National Museum of Computing - a separate organization, with a separate admission charge, that features Britain's early computer history, landmark developments and machines. Alan Turing was a genius mathematician, computer scientist and cryptanalyst. He was an early computer pioneer whose Turing machine, in the 1930s, was the first example of a working, general purpose computer. He actually formalized the concepts of the "algorithm" and "computation". Turing helped perfect the bombe machine that decoded thousands of intercepted messages at Bletchley. In January 1940, Turing's refined bombe machine decoded the first complete Enigma message. But despite his acknowledged brilliance and wartime contribution, Turing's story is one of the tragedies of history. Turing was an acknowledged homosexual at a time when homosexual acts were outlawed in Britain. In 1952 he was prosecuted for indecency after reporting a criminal break-in by a young man with whom he had had a brief relationship. He was convicted and, as an alternative to a prison sentence, accepted treatment with female hormones. Two years later, in 1954, he died of cyanide poisoning. Although the coroner ruled his death a suicide, his mother and other associates believed it was an accident. In 2009, then Prime Minister Gordon Brown, issued a public apology for Turing's "appalling" treatment. You can learn more about Turing, his life and contribution to cryptology and computer science at Bletchley. Who Will Enjoy Visiting Bletchley Park? Computer geeks, military history fans, mathematicians and budding mathematicians will find a visit to Bletchley Park fascinating. Junior spies and cryptogram fans will love it. Regular events, family Forties Days, re-enactions, temporary exhibitions and guided tours keep Bletchley Park interesting for other members of the family who may discover they are codebreaking enthusiasts after all. Where: The Mansion, Bletchley Park, Sherwood Drive, Bletchley, Milton Keynes, MK3 6EB. If using SatNav, use the street address but not the post code, which can lead you in the wrong direction. Admission: Adult, concession and family tickets as well as tickets for children 12-16. Children under 12 are admitted free and groups of children by prior arrangement. Facilities: Cafe in Hut 4, where the Naval codebreakers actually worked. Guided tours included in the admission price. Admission: Separate admission fees for all of TMOC or, reduced, for Colossus and Tunny. Concessionary fees for seniors and students. Children under 12 free. Visitors to TMOC only do not have to pay the Bletchley Park admission fee to enter the Bletchley Estate. Facilities: Coffee and souvenir shop, guided tours for a separate fee.